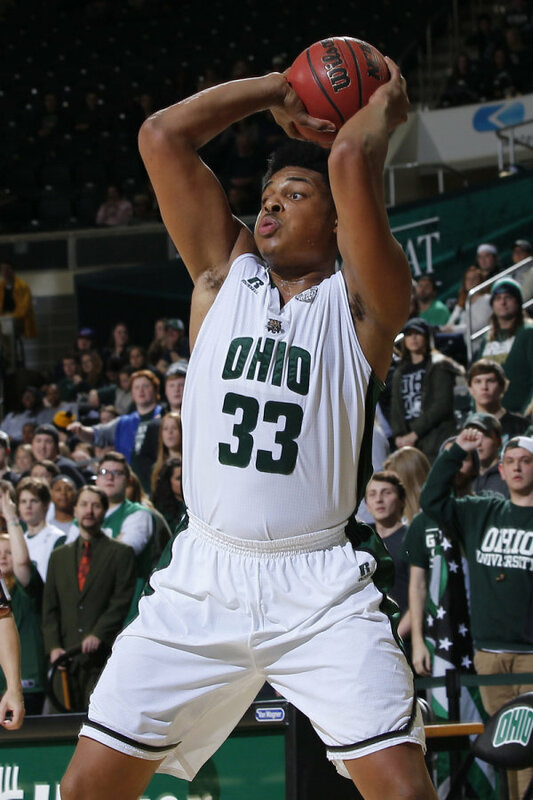 Ohio fended off a second half Miami surge and emerged with a 76-64 victory in Saturday’s “Battle of the Bricks.” Tony Campbell had a career day rebounding and Jaaron Simmons played a near-perfect game to lead the Bobcats to their fifth consecutive victory in front of a season-high crowd of 9,018. Campbell recorded a double-double of 16 points and 20 rebounds, the most boards by any MAC player this season. Simmons scored 25 points, only missing one shot, and failed to turn the ball over in the win. Ohio led by as many as 23 early in the second half, but Miami closed the gap to five points with eight minutes to play. The Bobcats built their lead with a 17-0 run early in the first half, but saw it nearly vanish. Ohio turned the ball over six times in five minutes during a 18-5 Miami run midway through the second half before Jordan Dartis reclaimed the momentum and reignited the home crowd with two 3-pointers in two minutes. Miami (9-18, 3-11 MAC) dressed just nine players in the defeat. Most notably, the RedHawks missed senior guard Geovonie McKnight and fellow starter Logan McLane. McKnight is the RedHawks’ second leading scorer and had started 60 consecutive games prior to Saturday. Ohio (18-8, 9-5 MAC) was also without a starter, Kenny Kaminski (concussion). Freshman Gavin Block got the nod in Kaminski’s place and totaled 14 points, 12 of those coming in the first half. The RedHawks attempted to limit the impact of Campbell, a candidate for MAC Player of the Year, by clogging the lane and not letting him post up in the middle of their zone defense, but the junior was still able to notch his fourth consecutive double-double and his 14th of the season. Dion Wade led the way for Miami with 16 points and seven rebounds. Abdoulaye Harouna added 15 points in the loss. Saturday’s MAC showdown was the 143rd installment of the “Battle of the Bricks” on the hardwood. Miami has not left the Convocation Center with a victory since 2006. The RedHawks lead the all-time series 77-68. With the win, Ohio moves within one game of the MAC-East leading Akron Zips. The Bobcats are currently second, tied with Kent State. The matchup with Miami was the first in a three-game stretch that sees Ohio take on the bottom three teams in the MAC East. The Bobcats will travel across the state Tuesday to take on Bowling Green.